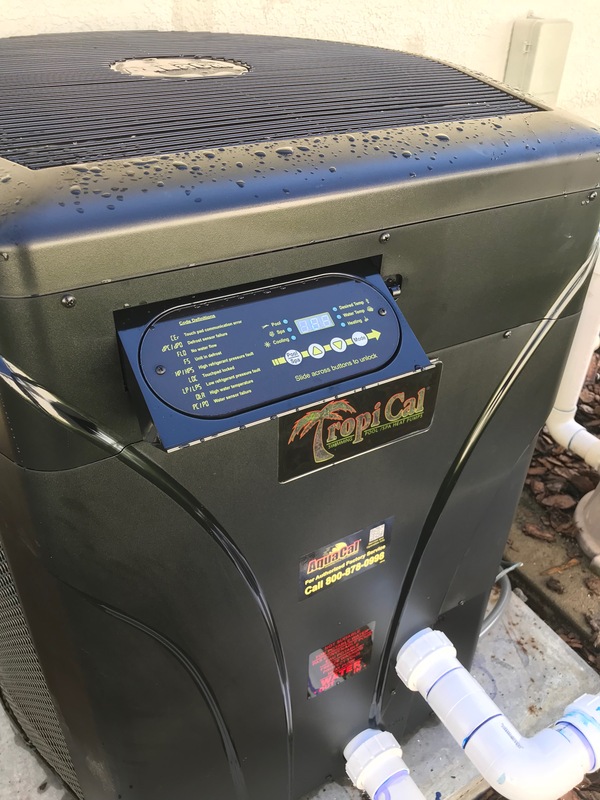 Heat pump pool heaters are becoming more and more popular to have installed in Central Florida. It’s sometimes tough to distinguish differences between pool heaters because many of the marketing messages focus on benefits, and not on what actually makes one pool heater different from another. 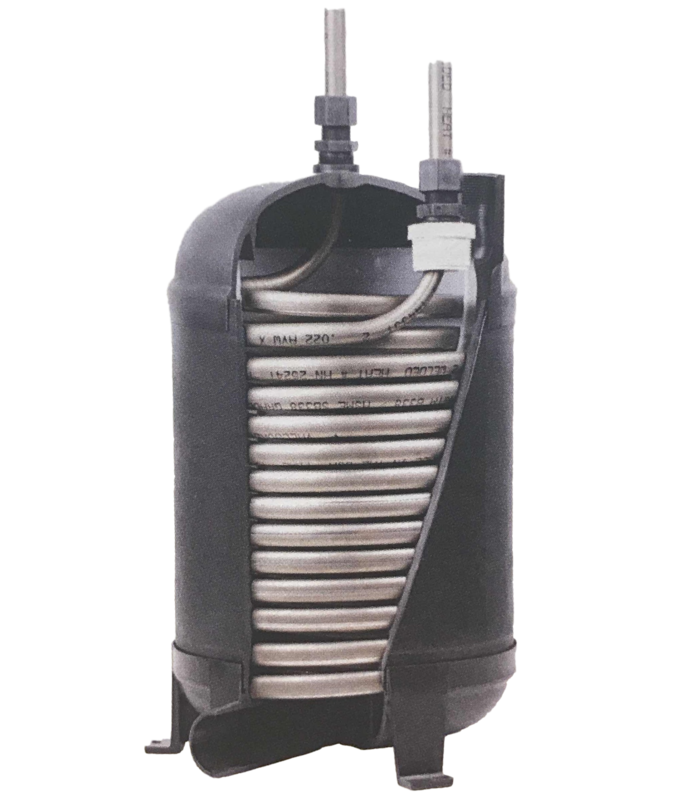 We’ve found one of the key features that separates a good quality heat pump pool heater from a poor unit is the type of heat exchanger used by the manufacturer. Firstly, its like taking a hot pan directly off of the oven and running water over it at the sink. This water hitting the pan usually makes a sound you can hear and the water gets so hot that steam comes off of the pan. Its hot to touch that water for a few seconds because the heat from the pan transfers to the water. This is what happens when the water runs across the hot surface. Secondly, its like sitting in a bathtub and turning on the hot water again after you’ve already been in the tub for a while. Down by your feet, you can feel that hot water mixing in with the colder water, but the whole tub has not yet heated up. 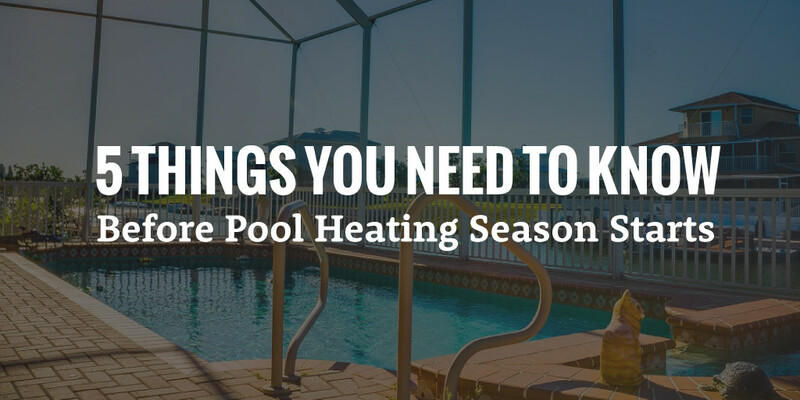 You’ll need to keep that hot water flowing into the tub in order for it all to feel comfortable again.This is what its like for the heat pump pool heater to heat your pool. Most of a heat pump pool heater’s efficiency comes from how effectively it can transfer this heat from the heat exchanger into the pool. That’s why its called a heat “exchanger”. Its exchanging heat from one surface (the coil) to another (the water). Traditionally, heat pump pool heaters have had whats called a “tube-in-tube” heat exchanger. The water flows through a tubed pipe, and on the inside of that pipe is a heat excahnger coil (usually made of an alloy called cupronickel). The water flows between this outer-tube pipe and the inner-tube heat exchanger coil and picks up heat as it flows through it. This was effective at heating the water, but one drawback to this style is the need to really push that water through that tube (it won’t just passively “flow” through that tube). AquaCal and Tropical heat pump pool heaters have been beautifully engineered with a “ThermoLink” heat exchanger. The water flows into the top of heat exchanger assembly from the top, and then uses gravity to flow down to the exit valve at the bottom of the assembly. The water is heated much more passively as it flows like a waterfall through the assembly. Plus, the coil is made from titanium instead of the traditional cupronickel. The cupronickel alloy is much more susceptible to weakening from sanitizers and chemicals found in pool/spa water. Titanium is much longer lasting compared with cupronickel because it is virtually impervious to water-chemistry damage (which is why AquaCal and Tropical units have a lifetime heat exchanger warranty). In the past, when single-speed pool pumps were the norm, tube-in-tube heat exchangers were sufficient because the pump would always be running with the same speed (pressure). In modern pool set-ups, we are seeing that two-speed or variable speed pool pumps are the new normal (new regulations will soon make them required by code). These pool pumps aren’t always running at the same “speed” (more accurately they vary the water pressure). Having a pool heater with a regular tube-in-tube heat exchanger renders the benefits of a varaible-speed pool pump useless because the pool pump must keep the water pressure at a high-level in order to push the water through that tube-in-tube assembly. The patented ThermoLink heat exchanger in the AquaCal heat pumps allow the pool pump to ramp itself down to lower pressures, as low as 1560 RPMs. The tube-in-tube assembly has to run at over 2350 RPMs, a 33% decrease in efficiency. This translates to about $25-$94 a month in energy cost that the ThermoLink heat exchanger will save customers compared to tube-in-tube heat exchangers. If you’re interested in a no pressure, professional estimate, fill out our request form below! What Day Works For You for an In-Person Estimate? A no pressure, in person estimate is required to ascertain the needed materials and sizing for the pool heater. The pool heating industry is a very different industry then many of us who are traditionally from the air conditioning industry are used to. Plain and simple many pool heater manufacturers are smaller and not as a stable as what most Americans have come to expect from a manufacturer. There is a lot of turnover/buyouts and it seems every few years there is a new low cost option that customers can choose, but do so at their own detriment. 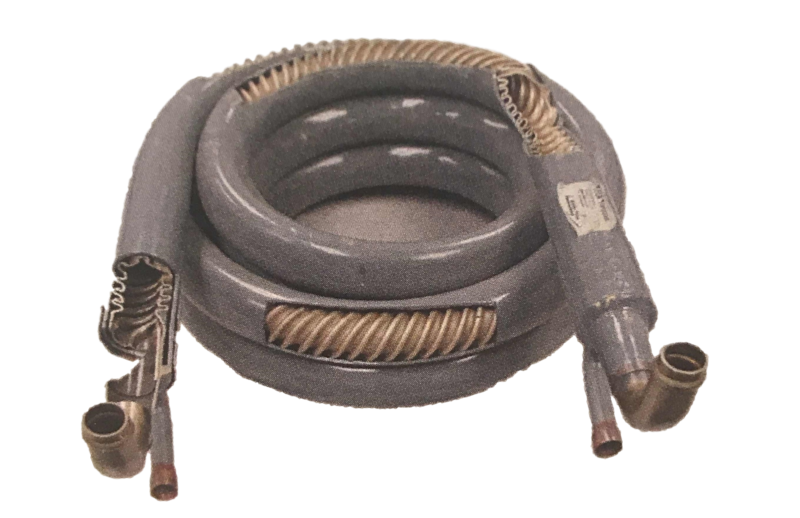 Additionally, many pool heater manufacturers have very little support staff or quality distribution for their replacement and warranty parts. Its this lack of support that makes us hesitant to suggest just any sort of pool heater for your home or business. That being said, we are thoroughly impressed with three manufacturers in particular, AquaCal (who also makes TropiCal units), Hayward, and Oasis. AquaCal heat pump pool heaters are the industry leader when it comes to quality, warranty, and customer support. AquaCal has in our opinion, the best heat pump pool heater on the market. The HeatWave Super Quiet (the flagship product) from AquaCal is proven to be the quietest unit in the pool heater industry. While many other units even have some form of “quiet” in their name or marketing, the AquaCal is proven to be the best in terms of decibel rating. These units are virtually silent; you won’t hear them running if you’re any more then 10 feet away from it. They are also the most efficient heat pump pool heaters. This is accomplished through their patented Thermo-Link Technology. Click here to learn more about the difference this heat exchanger makes for efficiency. This makes a huge difference in the units efficiency when paired with a variable speed pool pump. AquaCal’s Heat Wave Super Quiet also has a great feature for the Florida sun, a recessed control board. Pictured below (on the Tropical unit), this allows us to protect the control board to be protected from getting faded/damaged from the hot Florida sun, a great and innovative feature. One of our favorite features from AquaCal is the standard 2-year Labor Warranty. Unlike most pool heating companies, the AquaCal units comes with a labor warranty that is completely executed from the manufacturer themselves (if you’re located in Florida like us). 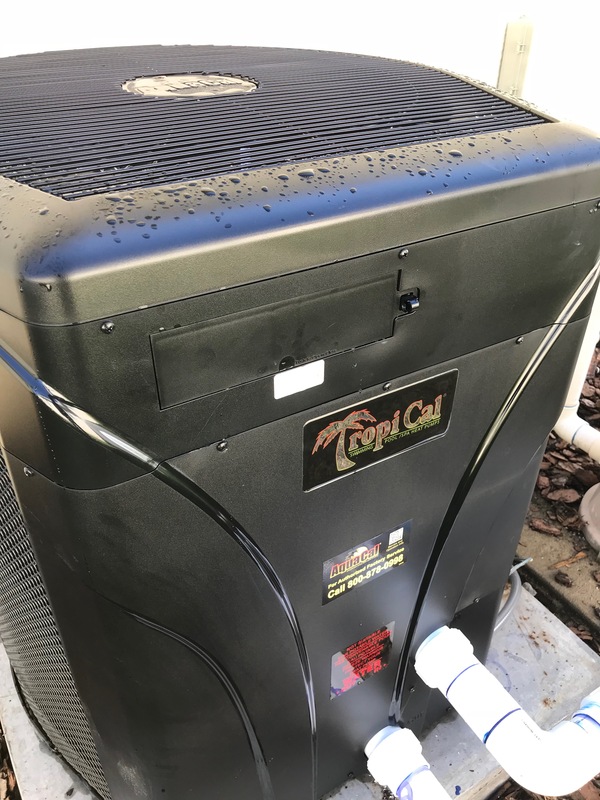 With other pool heater manufacturers, if the unit ever has an issue, a technician from the local contractor who installed the unit would re-visit the property to diagnose the issue. AquaCal instead dispatches a technician who is employed by them, the manufacturer to diagnose the issue and let you know what is wrong. An issue is incredibly rare for one thing (we just have not had many issues at all with these units), but it does show the length to which AquaCal will go to back up their product. They also have a seven year parts, seven year compressor and lifetime heat exchanger tube warranty. This is the best warranty for a pool heater that we have found to date. A great part about living in Florida is the fact that we are the pool heater manufacturer capital of the country (and really the world). AquaCal’s factory and headquarters are based out of St. Petersburg, Fl. 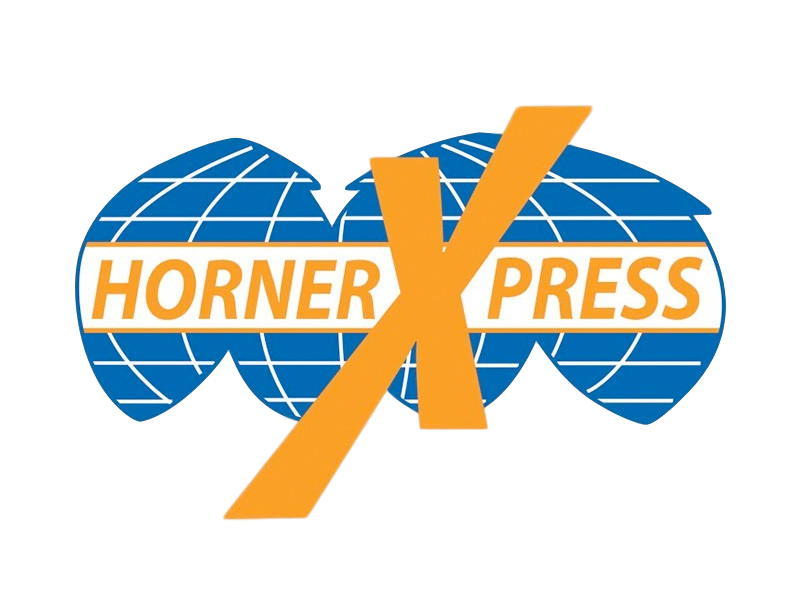 Additionally, they have the same parent company as their distributor HornerXpress (both are part of Team Horner). In simpler terms, the company and all of their replacement parts are streamlined to work together very efficiently and effectively. We’ve had no problems getting AquaCal replacement and warranty parts in a timely manner, meaning you wont be waiting for weeks for a repair part to come in when its not stocked locally. This is something we do experience quite often when repairing many other heat pump pool heaters that aren’t as well supported. In summary, we love the AquaCal Pool Heaters. Fill our this quick form below if you’re interested in getting a no-pressure estimate from us to install one! 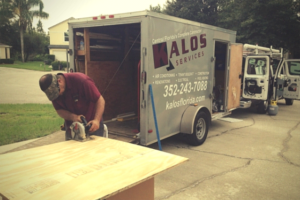 In the State of Florida and around the country, you hear stories all the time about unsuspecting homeowners being the victims of theft or scams by unlicensed contractors that work, or say, they will do work on their homes. It’s essential that when you let someone in your home or business, that you know they are a licensed professional. Hiring a licensed contractor offers many additional protections to the property owner, especially regarding residential property. First of all, a contractor can not obtain a license without possessing a minimum amount of experience and must pass a business management test. The applicant also may be subjected to a criminal history background check, and must not have any unresolved contracting complaints outstanding. So, here’s our Five Minute Process that could potentially protect you from a huge financial mistake. *We will be using The State of Florida as our example. If you live in another state, laws will be similar, but check your government’s regulations and laws for differences. For fastest results just follow this link to arrive at the search page. This is part of the MyFlorida.com website, and can be navigated to by clicking on the large red italic font “Licensee Search”, near the top of the page. To some, the link will look like a heading, but it is clickable. Find the type of Contractor you’re looking for and click that category. You’ll be be taken to a screen with various search options. If you are checking a particular company or a certain individual, click on Search by Name, but there are other options available as well. Click the Search button at right. Now you can enter in the information you know to search for a particular person or company. Usually, you will be able to find who you are looking for with their name and correct city. There you go! Though this won’t completely protect you from incompetence, it will at least protect you from scammers. This can be a great resource when you’re doing business with anyone that you have not properly vetted or without solid referrals. Check out website like Angie’s List or the Better Business Bureau for some reviews on how that company does business and if their customers are pleased with them!